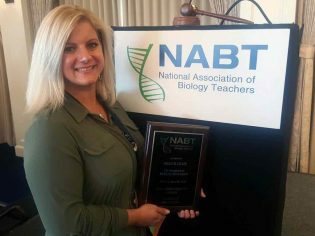 Amanda Glaze, Ph.D., assistant professor of science education at Georgia Southern University, recently received the national Evolution Education Award at the National Association of Biology Teachers (NABT) National Conference in San Diego. Sponsored by the Biological Sciences Curriculum Study (BSCS) center and the BEACON Center for the Study of Evolution in Action, the Evolution Education Award recognizes classroom teaching and community education efforts to promote the accurate understanding of biological evolution. The award is rotated between a K-12 teacher and undergraduate educator and includes a cash award, recognition plaque and a complimentary membership to NABT. Glaze focuses her research on evolution education and the intersections of science and society that come into play with acceptance and rejection in the U.S. When speaking about her research, she always informs the audience of her religious upbringing in rural Alabama, laying the groundwork for how she finds passion in both her faith and the sciences. Glaze has been invited to speak at numerous conferences and engagements including the Smithsonian Institution’s Broader Social Impacts Committee annual meeting and a guest speaker at the HudsonAlpha Institute for Biotechnology. Colleagues and current students contributed to Glaze’s nomination. They highlighted her passion for science education, specifically evolution understanding, and recognized her unique position as a common ground for a controversial topic. Glaze added that it is an honor to work with organizations such as NABT whose support and investment in science provide a “ripple effect,” helping to amplify the research and message of an individual such as herself to the broader community.